Trees within your landscaping can add significant value to your property by providing shade, protection for wildlife and aesthetic accents. But sometimes even the right tree has been placed in the wrong location, becoming a nuisance. Also, for any number of reasons a tree may become unsafe and hazardous to people or property, or become undamaged or unhealthy to the point where other methods of preservation are ineffective or too costly. Trees should only be removed after a detailed tree assessment and analysis by a certified arborist. Most municipalities now have strict bylaws about tree removal. Our staff can help you determine the best course of action for your tree in any of the Lower Mainland municipalities. Tree removals can often be hazardous and complicated. They should only be handled by professionals. There are complex procedures involved in removing a tree effectively and to minimize risk to person and property. 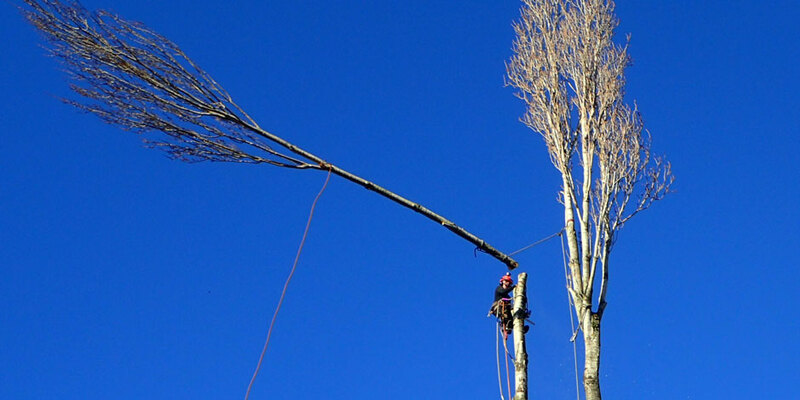 Wilson’s team is highly specialized and experienced in technical rigging and handling complex tree removals in confined spaces using either traditional techniques or with the aid of a crane. These skills allow us to remove unwanted trees without accidental damage to your home or persons. The first thing that you want to look at is the base of the tree where it meets the soil, or root flare of the tree. Take notice too if you see any saw dust or carpenter ants going up and down. Saw dust and ants are a good indication that some wood decay is taking place. If the tree has wood decay that also could mean that it might have some other things wrong with it that you can’t see. If the tree doesn’t have a root flare, it could mean that someone in the past might have re-graded your property and put too much topsoil over the roots and the root flare. In time, this will cause the tree to decline because the trees feeding roots, which are in the first 10-12” of the soil are now covered. This will then prevent the tree from getting water and nutrients. When looking at the root flare, take notice for mushrooms or any type of fungus growing on the bark. Mushrooms grow on decaying wood. This is one of the best ways to tell if your tree is dying. The trunk of the tree supports the weight of its branches. Look for holes, cracks and peeling bark. If the trunk of the tree is starting to decline, that will weaken the entire integrity of the tree. Wherever you see an area of the tree without bark, then that means that side of the tree is not getting nutrients. The tree’s transportation vessels for nutrients are underneath the bark.